Some like it hot–and it’s better for you than you think. In addition to its own antioxidant alkaloid phytochemical piperine, black pepper is a potent catalyst that increases the bioavailability of other anti-cancer and anti-inflammatory compounds. Piperine stimulates cells to make them absorb nutrients from food and retain them longer. Bioavailability is important because it refers to the body’s ability to effectively use the nutrients in the food we eat. We can take all the synthetic vitamins we want but unless our cells can use them to maintain health, they are virtually useless and can in fact be harmful. Eating a variety of foods helps to provide us with what we need and in combinations, individual nutrients can become even more readily absorbed. Such is the case with black pepper. Especially significant is the effect of black pepper taken together with curcumin, the active medicinal component of turmeric: taken together, the body absorbs curcumin two thousand times more effectively. Curcumin is known as an anti-inflammatory and tumor-inhibiting phytochemical that has been shown to have significant implications for cancer and neurodegenerative diseases like Alzheimer’s, in addition to treating depression. Piperine works to increase bioavailability by inhibiting enzymes that break down nutrients, slowing and thereby allowing them more time for use in the cells; it stimulates amino acid movement; and lowers the incidence of oxidation in cells. Piperine stimulates digestion from the pancreas to the intestines, allowing cells to gain more nutrition through other foods. Piperine also increases serotonin and melatonin production–so important to our sleep cycles–and supports brain function and cognitive ability. Its anti-depressant properties work by increasing these and dopamine levels. Black pepper has also been found to help with weight loss by helping the body burn calories through thermogenesis–it’s a hot spice. Promising research is ongoing into the use of black pepper for the treatment of vitiligo, an auto-immune condition in which skin pigments stop producing normally. The piperine in black pepper is also an effective anti-cancer agent: cancer cell growth was arrested and further spread inhibited in studies on breast and pancreas cancers. 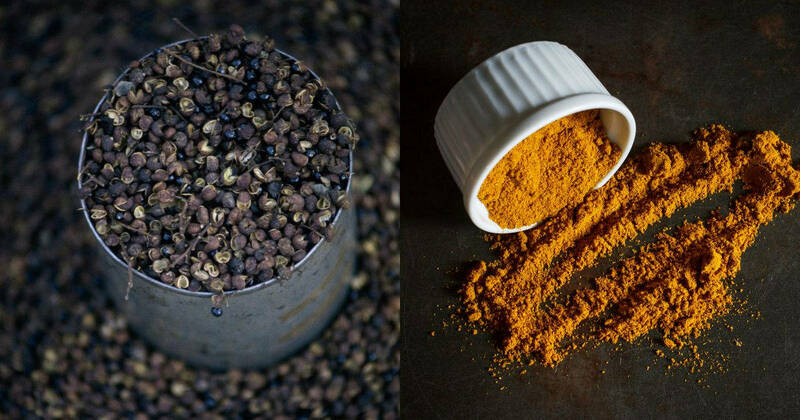 Spice up your life and support your health–sprinkle black pepper (and curcumin!) on whatever you eat (raw or cooked), in a smoothie or coffee to help your body work better and prevent disease.